This May max your commissions with Condor Affiliates! 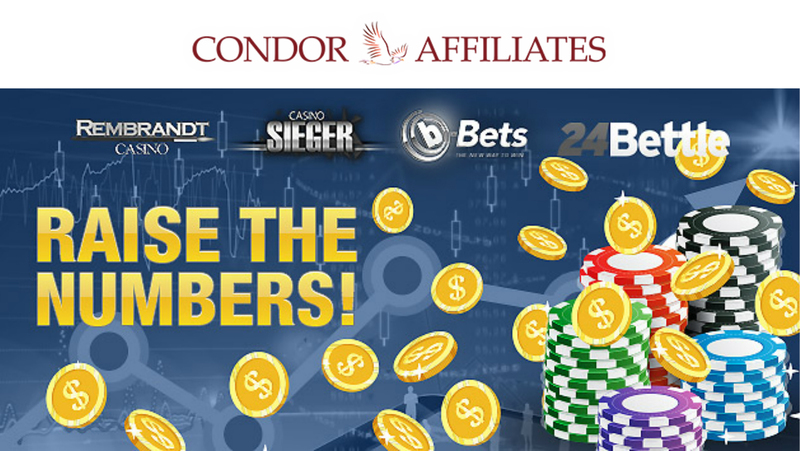 Make it a mega May – max your commissions with Condor Affiliates! After an awesome April that saw Condor Affiliates results skyrocket, they’ve prepared even more mouth-watering May offers for their Fantastic Four: Rembrandt, 24Bettle, Sieger and b-Bets. Make sure you let the casino world know about these specials and get your hands on massive commissions. Packed with new Microgaming and NetEnt games, this May promises to be a truly magnificent month. As always, Condor Affiliates go one better than the competition, with exclusive promotions celebrating these latest slot hits by offering your players tons of top prizes! And of course, stay tuned for some more marvelous May news as their teams are working hard on the integration of new gaming providers in order to guarantee the best casino entertainment in the business. Spread the word about the premium promotions and max your May commissions! 24Bettle’s cracking casino calendar satisfies every taste by offering top boosts and bonuses on a daily basis and helps you maximize your profits! b-Bets’ May promo calendar is just as stellar! With unmissable daily offers in store, your players can’t help but fall in love with May’s bonuses galore! Make a fortune with Casino Sieger’s “Mystery Monday” ! This month every Monday a special surprise will be waiting for your players! Rembrandt’s Casino “Take Away Tuesday” promotion will continue in May! Each Tuesday special reloads for your players, plus more promotions during the weeks to come! Keith Zammit is Affiliate Manager at Condor affiliates, business oriented, neighbour loving, quiet conflict solver, with a deep entrepreneurship vain, a passion for all things Digital and a love for writing! Affiliate Manager at: Condor Affiliates. GAV: Hello Keith, first of all, tell us and our readers a bit about yourself. How did your career start in the industry? What determined you to engage in this activity and start working at Condor Affiliates? KZ: I was born and raised on the island of Malta, but I do not have a typical island mentality. Adventure, Open Source, foreign influence… these things excite me… However, that does not mean that I don’t have a Maltese approach to life. I love fine wine and great food by the sea, and I look forward to the village feasts with cold beer and amazing firework displays all summer long. My Career in Affiliate Marketing started way back in 2010, when a friend of mine and I started building niche websites as a side income at Uni. During the glory days of online poker we built a network of Poker Niche sites that was eventually acquired by a Network. Having been in contact with a number of affiliate managers over the years, I always said that one day I would cross the fence and join the casino side. I was eventually contacted by Condor Affiliates and decided to take on the challenge. 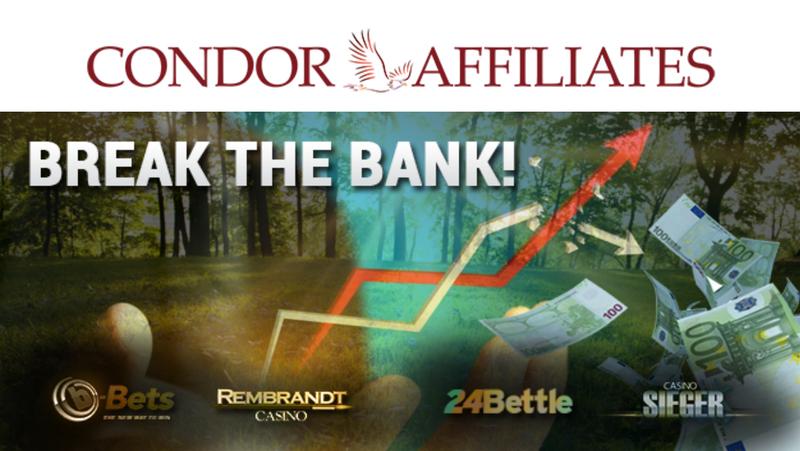 GAV: Condor Affiliates is the affiliate program for online casino brands Rembrandt Casino, Casino Sieger, b-Bets and 24Bettle. What do you think is the key aspect that affiliates appreciate regarding your affiliate program? 1. We have a custom built back end system which allows us to show tailor-made reports to our affiliates. 2. Even though you have 4 brands to market, the revenue is separate, and we do not have a negative carry over… so should you have a negative balance on one brand, this will not affect your income on the other 3 brands. 3. Our brands all have something unique in character, from GEO targeted styles (Casino Sieger and Rembrandt Casino) to an Auctions Based Loyalty Program (b-Bets) and also a gamified platform in 24Bettle, which increases retention and re-deposits. 4. In addition, we have a strong Sports Betting pull, which allows us to cross-sell from Casino to Sports and back… increasing our affiliates Revenue. GAV: What is your personal opinion about fair gaming? Do you think there is still room to improve the general view and perception of the gambling industry? I mean, is there a new generation prepared to do that? Both Affiliate Manager and Affiliates. KZ: It is every gambler’s innate fear that online casinos can be rigged, and that the payouts can be meddled with and modified by the Casino Managers. In reality, when it comes to RNG and licensing many know that this area is heavily audited and that the game providers are always under scrutiny by the Gaming Authorities. In our case, we have a Malta License, which is very strict when it comes to fair gaming. It is up to us as Affiliate Managers and the Affiliates to really push forward the reassurances that there is no interaction between the Casino and the Payout % and a chance of winning, and that Casinos who comply with Fair Gaming standards set out by the relevant gaming authorities should proudly display this, and make sure that the players are aware that the casino is running a fair game. GAV: Could you fill us in on your current offer for affiliates and maybe a brief description of your program? KZ: Our Program has been designed to help you maximize your income. We work on a revenue share model with no hidden fees and no additional hidden deductions. Thanks to our special welcome promotion, you can get a 45% revenue share for the first 3 months! There is no negative carry over and no player quota with us either! 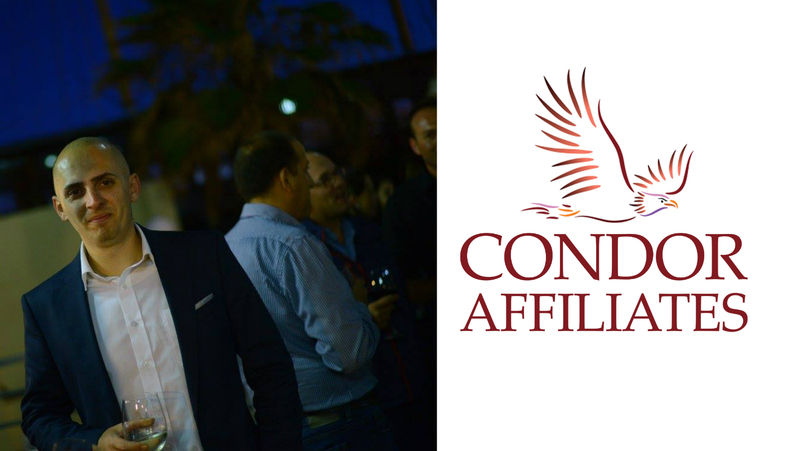 At Condor Affiliates, our goal is to build long-lasting, trustworthy and mutually successful relationships with affiliate partners. As a partner, you’ll be promoting products which are worth your efforts and your time. Sending your traffic our way always translates into high ROI. This is why our focus is set on player retention by constantly launching fresh, exciting promotions and targeted rewards. We like to reward our affiliates too! GAV: What markets does Condor Affiliates target, and what makes it stand out in the ever growing crowd of sports betting and casino affiliate programs? KZ: Currently, our target Markets are mainly Central and Western Europe as well as the Nordic Countries. We also support quite a few languages on our websites. Having said that, we see players come from all over the world, with a few exceptions! We are actively working on acquiring our UK Gaming License and look forward to start accepting UK Players in the very near future as well. As mentioned previously, apart from our 45% Revenue Share deal, we offer you to promote 4 casinos that have no negative carry over, no player quotas, fast payouts and most of all statistics can be viewed inside one affiliate account for all brands. 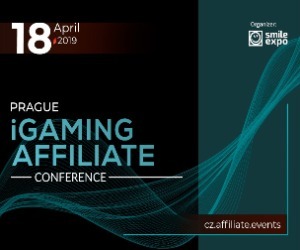 GAV: Since the Amsterdam Affiliate Conference is almost here, we would like to ask your opinion on this event, are you guys attending these conferences or are you going to be in Berlin? How about SiGMA and the brand new Nordic Affiliate Conference? KZ: We will be at AAC this year and we believe that participating at affiliate conferences allow us to meet our current and potential partners and get to know them on a more personal level. It is very easy to speak on Skype and arrange a quick meeting in person see the person, but in the buzzing atmosphere of the conferences, we can create a real connection, make them thrive and hopefully last for many years. Berlin is one of the cities we really love and we will be surely attending conferences there too! Since we are based in Malta, SiGMA is always a favourite of ours and we have built many new relationships through these events and look forward to being there again this year. The Nordic Affiliate Conference is a very exciting one for us, since that is one of our largest target markets, and we are already discussing our participation there. Maybe we could find a bird handler who has a Condor? Hmmmm…. GAV: Where do you think the online sports betting/casino industry will be in 3 years, and of course, on which scale do you see Condor Affiliates? KZ: The industry is always moving into a stronger position and with new casinos showing up every day, the market reach is getting better. There is always the slight worry that individual countries will limit the activities of Remote Gaming without a specific licence for each country, but here at Condor-Affiliates we are always building towards servicing as many countries as possible. I believe that over the years our brands will grow further and further. We have recently expanded our affiliate team and we have also opened a new office in Bulgaria… so definitely expect greater things from us shortly! GAV: Tell us a bit about your team? As we know it’s quite made of enthusiastic professionals, who think out of the box, and deploy even the wildest ideas, thus transforming the the online gaming market, through innovation and reliability. KZ: Currently our Affiliate Team is being expanded (is growing steadily) and we are always on a lookout for the creative geniuses to take our and our affiliate’s efforts to the next step. Being a flexible company we are focused heavily on the individuals and therefore we are more keen on creating custom tailored solutions for both, our players and our affiliates. This is where I believe innovation is created, as we get to hear it straight from the users and this is how we then create innovative plans designed specifically for them. But of course there is more to it other than only the affiliate team. We have great colleagues in the company, who are also making the magic happen (behind the scenes). I have witnessed some great product training sessions, brainstorming events, and our conference room being invaded by teams who were working on truly exciting projects which are completely new and upcoming. I can not tell too much about this, but one thing i can already see: it will be revolutionary, out of the box, and the wildest ideas are coming truth!! GAV: Since Central and Eastern Europe offers a large pool of successful affiliates in the industry, do you think that this region is somehow overlooked by brands that are not applying for licenses in the demographic and are there many super-affiliates that you managed coming from this region? When it comes to Licenses, we are always monitoring potential market opportunities. Now our priority is to get through the UK application and obtain UKGC License, which is going to be a very nice opportunity for our brands! GAV: Who is your favourite celebrity and if you’d have to a pick a destination in Eastern Europe, where would you travel? KZ: If I had to pick any celebrity I would have to go with Frank Sinatra. I am an avid lover of music and there is an old world gentleman charm that Sinatra portrays. Eastern Europe destination would have to be Budapest… I’ve been there 4 times already and I think I would like to stay there for an extended period of time and get to experience living there. GAV: Where you wouldn’t want to travel? KZ: The Sahara desert. Malta already reaches temperatures of 40 Degrees Celsius and during our Summer months and I cannot stand the heat. So I cannot imagine myself traveling in the desert..
GAV: Tell us your opinion about GAV(GamblingAffiliateVoice.com)? KZ: I get onto GAV everyday to read the latest news section as well as following the group discussions. I think it is very important to always be aware of the latest happenings in the Affiliate Industry, and GAV always have the latest… so for me it’s a must! GAV: Thanks for your time Keith, we appreciate it and wish you and Condor Affiliates all the best! Spring has arrived and the results are blossoming for Condor Affiliates partners. The March Calendar promotions for 24Bettle and b-Bets have increased the deposit and retention rates, thus, helping boost your affiliate commissions. April is on the way so Condor Affiliates will push even harder to increase your revenue even more! The Nordic Affiliate Conference is taking place in Stockholm from 6th – 7th April 2017. Condor Affiliates team will be attending the event and if you have not yet scheduled a meeting, hurry up! We will have even more thrilling news coming your way in the upcoming month(s), their teams are working hard on the integration of new gaming providers and bonuses. Get the word out about their fantastic promotions during the month of April and break the bank together! Every Tuesday during the entire month of April your players can choose from wide variety of reload bonuses on top of all other promotions running throughout the month! 24Bettle will treat your players with a different bonus each day throughout this month! Casino Sieger players will enjoy Cool Wednesdays during April – Free Spins, reload bonuses and more, along with special Easter promotions! b-Bets Sports players will enjoy 100 BidBets absolutely free on top of the 100% Welcome Bonus of up to €100! Condor Gaming has been granted Maltese license! New 24Bettle Sports is Live! 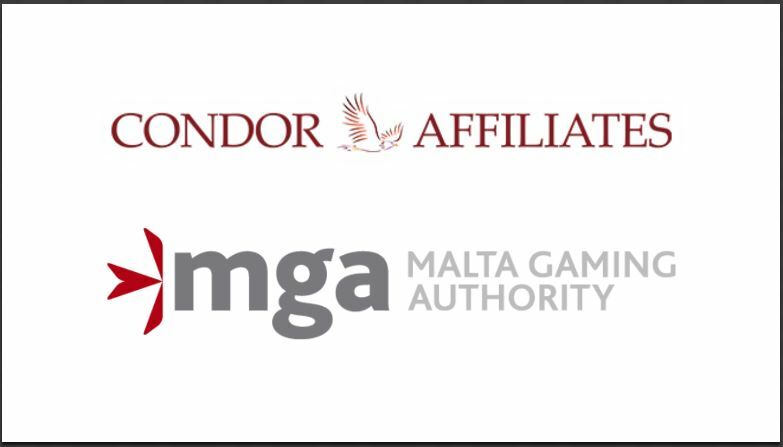 Exciting news: Condor Gaming (powering Condor Affiliates) is the proud holder of the Malta Gaming Authority License. What does this mean?! All Condor Affiliates brands are now operating with the MGA license: Rembrandt Casino, Casino Sieger, b-Bets and 24Bettle! Following the success of the launch of the new Sports software on b-Bets, they have now gone live with the New Sportsbook platform on their other brand: 24Bettle! Along with a new welcome bonus on sports as well: 100% up to €100! LAC 2017 is just about to start and the Condor Affiliates team will be very excited to meet you in person. they have unique offers in store for you, so make sure you book a meeting! They will take your revenues to new heights this year. Make sure to get the word out about the Malta Gaming Authority license, new Sportsbook and the New Sports welcome bonus for 24Bettle!